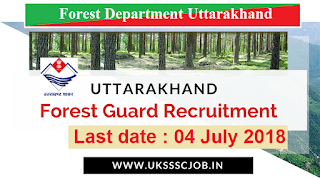 UKSSSC has published a Uttarakhand Forest Guard Recruitment 2018 notice for the vacancies of forest guard. The numbers of posts are 1218. All interested and eligible candidates may apply online through official websites of UKSSSC home www.sssc.uk.gov.in . Its a good opportunity for the candidates who are looking for Govt jobs in Uttarakhand forest department. All other detail about Uttarakhand forest guard vacancy 2018 like education Qualification, application form, Admit card download, Exam syllabus, pattern, Exam date, results are given below. So please read the below article carefully before applying for the posts. Candidates applying for Uttarakhand Forest guard recruitment 2017 should have 12 th pass from a recognized board. For Other detail read the Uttarakhand Forest guard official notification 2018. (The link is given below ). Candidates who are applying for the Uttarakhand forest guard recruitment 2018 have a minimum age of 18 years and the upper age limit is 28 years. The application form is available on UKSSSC official website www.sssc.uk.gov.in. Candidates can check all the necessary condition on Uttarakhand Forest guard official notification 2018 before applying for the posts. UKSSSC will conduct the exam of Uttarakhand forest Guard recruitment 2018. The syllabus of Uttarakhand forest guard is as following. Uttarakhand Forest Guard syllabus 2018: The complete syllabus of Uttarakhand Forest guard is as following. Uttarakhand Forest Guard Application form: The application form of Uttarakhand Forest Guard will be made available on official website of Uttarakhand Subordinate Service Selection Commission. All eligible and interested candidates may apply online before 04 July 2018. Uttarakhand Forest guard result 2018: The Uttarakhand Forest Guard Result 2018 expected to declare on December 2018. The UK forest guard results will available on the website of Uttarakhand Subordinate Service Selection Commission UKSSSC. 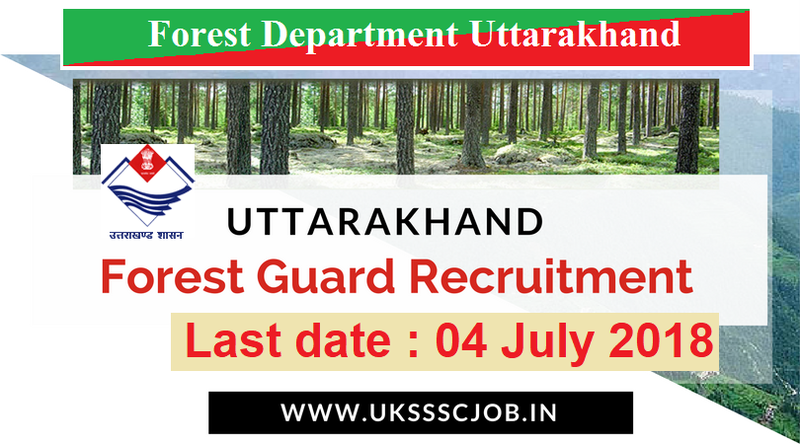 Candidates who have applied for the Uttarakhand Forest Guard post 2018 can check their result and cutoff marks on UKSSSC Official Websites or direct link publish on www.ukssscjob.in. m i eligible for this exam, my dob is 25/08/1992. MAINE 12TH COMMERCE UK BORD SE KIYA HAI KYA MAI FOREST GUARD WALA FORM BHAR SKTA HU? sir i have registered and applied for this application. but now i have to pay fee. but there is showing no link for this application now. kindly help.